Yossi Milo Gallery North is pleased to announce an exhibition of color photographs by Taj Forer from the series Threefold Sun . The exhibition will open on Thursday, October 25 and close on Saturday, December 15, with a reception for the artist on Thursday, October 25 from 6:00 to 8:00 pm. This will be Mr. Forer’s first exhibition with the gallery and his first solo exhibition in New York. Taj Forer recently traveled across the United States photographing people and places influenced by the work of Rudolf Steiner (1861-1925), the Austrian philosopher, scientist, educator, and artist. 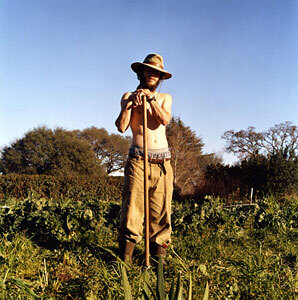 The exhibition will feature handmade 20″ × 20″ C-prints of the resulting portraits and quiet interiors, taken at Waldorf schools and biodynamic farms. Rather than forming a specific narrative, Forer uses his medium-format camera to both illustrate and practice Steiner’s fundamental philosophy that spiritual wisdom can be accessed through simple, everyday interactions with nature. Without staging the scenes or manipulating the images digitally, Forer elevates an empty tree house, a row of children’s galoshes or a May Pole in January, to idyllic, golden-hued utopias. Threefold Sun will be presented at Yossi Milo Gallery North (531 W. 25th St.) concurrently with an exhibition of drawings by Oskar Korsár, entitled No Wind Can Blow Us Down , at Yossi Milo Gallery (525 W. 25th St.). Taj Forer’s first monograph, Threefold Sun , will be published this fall by Edizioni Charta and will accompany the exhibition. Mr. Forer was born in New Jersey in 1981 and studied at Sarah Lawrence College and the University of North Carolina, Chapel Hill. He is a Founding Editor of the Contemporary Photography publication Daylight Magazine and currently lives and works in North Carolina.